Picking the perfect photo or video to post on Instagram can be a challenge, but now, thanks to a new update, you don't have to choose. After it was first spotted in beta, Instagram is officially rolling out a feature that lets users bundle up to 10 photos and videos in a single post. The images will appear in a gallery view, letting your followers swipe through to see what's next. While this all-in-one format will help prevent you from spamming your feed (how many photos of your last vacation do we really need to see? 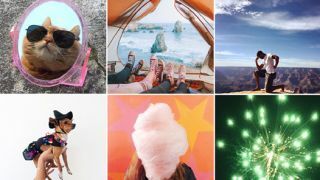 ), Instagram imagines uses such as chronicling a birthday party from decorating to blowing out the candles, or detailing a step-by-step how to for your followers. When uploading images, you'll see a new icon to help you select more than one. If you want to change the order in which your photos and videos appear, simply press down and move the slide. Adding filters and other edits can be done individually, or applied to the entire post. Unfortunately, you currently can't write a caption for every image, and all posts will appear in square-only view. If you're scrolling through your feed and see a post with little blue dots along the bottom, it means you're in for a multi-parter. If you're on someone's profile, a small layered icon will denote a slideshow post. To access Instagram's latest, make sure you have the most current version of the app on iOS and Android. Instagram says the feature will be available globally over the coming weeks.